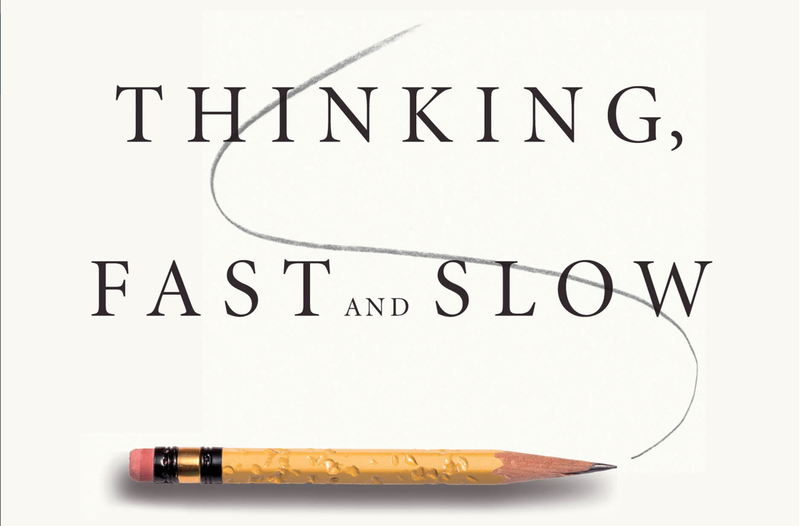 Thinking, Fast and Slow by Daniel Kahneman – ruru's ruminations. Don’t trust your own judgement. At first glance this hefty book may seem like a compilation of daunting concepts and unmoistened bare facts- the book is indeed dry and may come across as an esoteric psychological analysis of a specific area in the cognitive sciences. However, it is reasonably conveyed in layman’s terms- and the content the book so cherishingly holds is perhaps even more revelational than any of Malcolm Gladwell’s works. Many of the things that Kahneman (his name is ridiculously convoluted; each time I type it I have to take a few seconds to check the spelling) writes about may strike you as some sort of an ‘Eureka’ moment- Kahneman somehow finds the right words and the right research to shine light on those shadowy notions that so ambiguously prowl the outskirts of the typical questioning mind. Okay, think about this. [Think, hah. Get it?] We have two systems, one that involves intuition and involuntary actions; the other voluntary and entirely effortful mental activities. System 1 provides fast reactions and intuitive answers; System 2 filters them and decides whether to exert more metal effort. Sounds good so far? Humans rely on System 1 too much sometimes to give a rational answer or react rationally to situations, and therefore we’re placed at the mercy of many forms of cognitive biases. And for the rational human being that wants to be a separate entity from incorrigible human irrationality, this is a topic of great interest. I’ve been having a lot of these ‘Eureka- I’ve seen this somewhere, I see the link, I see the light!’ moments lately; as if all the interconnected happenings of the world are suddenly converging together at this acute point of my inner mind- short of an epiphany, but greater than a revelation, no doubt. Thinking about thinking, with all its concomitant confusion and head-scratch-inducing perplexity, reveals a lot about the world and how it’s interconnected. How we think, how we perceive things- they define everything. Man is the measure of all things, no? Whether about priming, or anchors, or less-is-more conundrums, this book never ceases to amaze and remind you that the mind is open to manipulation. In fact, it welcomes chicanery as a best friend. It wants to be tricked. System 2 is quiescent; it doesn’t want to exert the effort and watch out for these little tricks. A rational person cannot let this happen; we should continually be on our toes and not just accept things as is. Question things. Think critically. When I came across anchors, I couldn’t help thinking about economics; to what extent does a valuation of a good simply depend on constructs of the mind? If the willingness of any person to pay for something could be so drastically altered just by suggesting a value, then how do we evaluate the prices of different goods? Relatively? Comparatively? To make an adequate judgement we need to keep a rational mind and find out more about the world. Is it better to be the only irrational being in the rational world, or a rational being in an irrational world? Our irrationality is perhaps the cause of the majority of our flaws, we weigh situations with deplorable irrationality and end up choosing the wrong things despite the evidence of truth; we choose emotion over phlegmatic placidity, and we take on an egocentric perception on life that ends up being the biggest tool for irrationality. Egotism. Having too much confidence and trust in oneself. And yet as our irrationality mars the image of humans as a rational species; what distinguishes humans from robots is indeed our irrationality. So is irrationality our distinguishing trait or our blemishing fate? That is entirely up to you to decide.